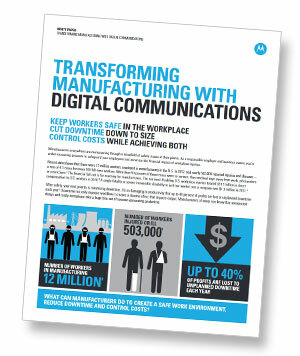 Discover Why Manufacturers are Upgrading to the MOTOTRBO™ Advantage. That was the average increase in productivity realized by companies once they implemented mobile solutions on the plant floor, according to a Motorola Enterprise Mobility Manufacturer Barometer Survey. With the right technology, manufacturers can drive intelligent production in their plants and factories. The challenge is that factories can create a noisy environment, and clear communication is paramount for productivity and safety. 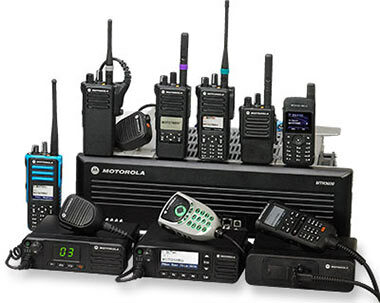 Air Comm recommends Motorola MOTOTRBO solutions to keep your company in touch. MOTOTRBO is a complete two-way radio system that includes portable and mobile radios, repeaters, accessories as well as powerful data applications like text messaging and location services. With greater durability and battery life compared to analog or cell phone solutions, it's specifically designed to meet the tough requirements of the manufacturing industry. Push-to-talk (PTT) applications enable immediate communication with workers. Adding carry accessories make it simple for workers to clip their radio onto a belt, while our HD Headsets allow users to talk without holding the radio. Noisy manufacturing equipment? 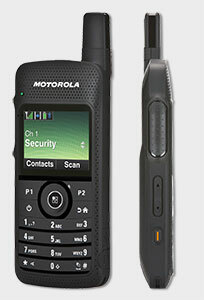 MOTOTRBO provides digital noise suppression and audio that stays clear even in noisy environments. The Intelligent Audio feature (on certain models) automatically adjusts radio volume up and down in response to the level of noise in the workplace. When paired with Motorola’s IMPRES audio accessories, noise suppression is increased even further. When audio communication is simply not possible, MOTOTRBO Text Messaging Services allows communication between radios and dispatch systems. Our SCADA remote monitoring and control systems monitors your equipment and automatically communicates its status. For example, if a machine malfunctions in a production room, the SCADA application can automatically alert a plant engineer. This solution ensures the right people get the message immedicately using text-based issue management software. Integrate WTM with your existing work-order management solution or operate it as an independent system. Jobs can be automated. For example, if assembling equipment breaks down on the plant floor, work order ticketing automatically alerts the correct technician to remedy the problem.